Across 2 Cultures - Cross-Culture Parenting and Lifestyle Blog: A day out and her new carrier. In preparation for our coming trip to Singapore where I will be travelling alone with Laetitia on the return flight back to Paris, I bought the Ergo baby carrier (as she is almost outgrowing her Baby Bjorn carrier). The carrier allows toddlers up to 20 kgs to be carried on it and it seems to have a much better balance of weight support on the back. Anyways, we tried it out over the weekend when we went to visit Baby Alrik and his parents. 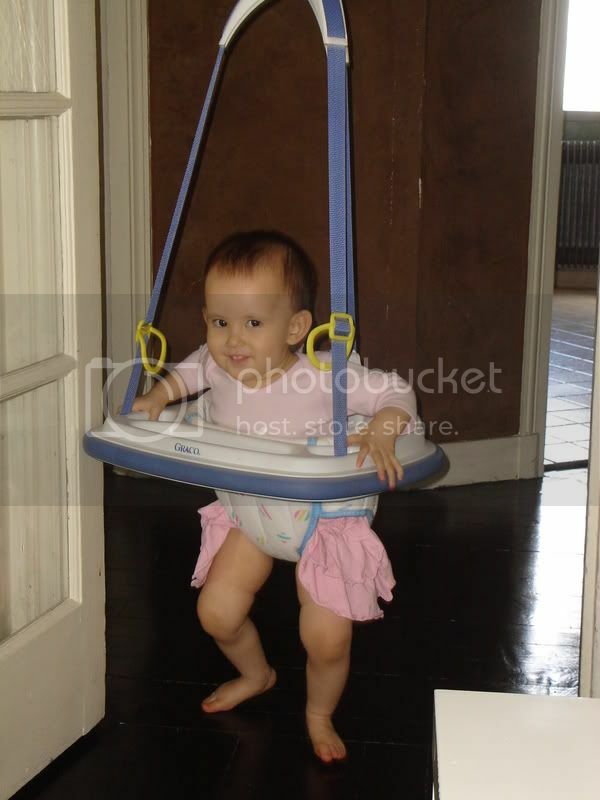 While we were at their place, Lae got to try on one of those jolly jumper/jumperoo things. She had quite a bit on fun on it but was too impatient to stay still in one spot. That's the thing with mobile children I guess. I have been following this blog for quite some time. And Lae lae is really cute! How I love her cheeky grin. She now mixes her cheeky grin usually with a mischievous act. Sigh... So hard to be upset with her when she does this 'act cute' routine.